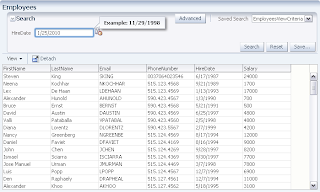 I got a question about how to assign default value for Date type field available in Query Criteria. Developer had a requirement to initialize Date type query field with date equal to 10 days before current date. This requirement is very simple for ADF and can be implemented in 5 minutes without writing any code. 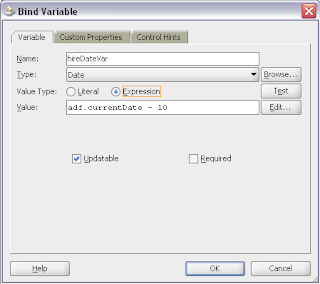 This will initialize Bind Variable with Null value, when user will try to search with empty HireDate attribute value. 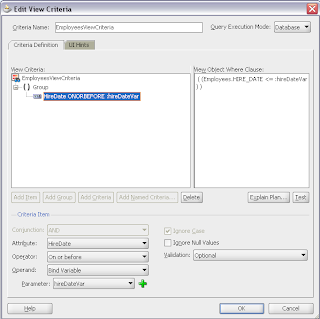 Otherwise you will get Missing In and Out parameters SQL error. In my application i tried the same. but the date is not getting displayed. I am not able to understand why it is not displaying though i followed the same as per your blog. I tried the same its working fine. Got help from this blog post. Can i Show the time in the Search criteria beside the date?